Pollen storage in a colony of Apis mellifera is actively regulated by increasing and decreasing pollen foraging according to the “colony's needs.” It has been shown that nectar foragers indirectly gather information about the nectar supply of the colony from nestmates without estimating the amount of honey actually stored in the combs. Very little is known about how the actual colony need is perceived with respect to pollen foraging. Two factors influence the need for pollen: the quantity of pollen stored in cells and the amount of brood. To elucidate the mechanisms of perception, we changed the environment within normal-sized colonies by adding pollen or young brood and measured the pollen-foraging activity, while foragers had either direct access to them or not. Our results show that the amount of stored pollen, young brood, and empty space directly provide important stimuli that affect foraging behavior. 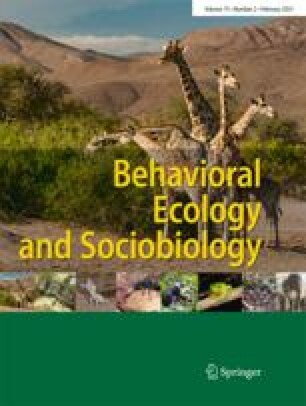 Different mechanisms for forager perception of the change in the environment are discussed.